Cut off the amount of soap base you want to use and place it into a microwave safe bowl. 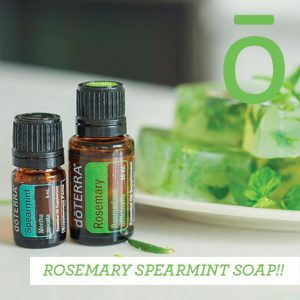 Melt the soap into liquid form in increments of 30 seconds. Add a handful of dried herbs to the soap mold. Add Spearmint and Rosemary essential oils. Mix together and pour into molds. Let it sit for an hour. Remove the soap from the mold.